Refer to the exhibit. A customer is looking to deploy local radius authentication on their WLAN controller. After configuration has been completed, the administrator found that computers could authenticate; however, the VoIP phones could not. What is the problem given the output? A. 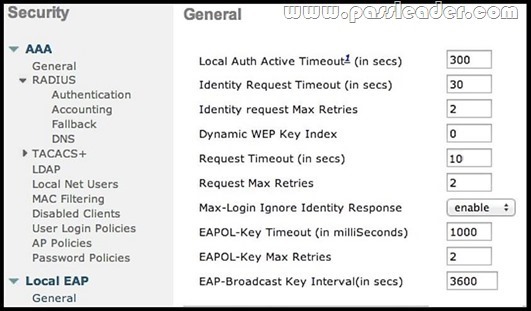 The EAP request-timeout is too short for the wireless phone to process the PAC from the WLAN controller. B. The EAP Broadcast Key interval is set to 1 hour however should be 8 hours. C. EAPOL-Key Max Retries should be set to 12 to ensure the wireless phone can authenticate. D. EAPOL-Key timeout should be set to at least 20,000 Milliseconds to allow the PAC to be processed. A trouble ticket has been turned in for a voice over wireless deployment. The customer cannot edit network profiles on their 7925 series phones and states that the profiles are locked. What key combination will unlock the profiles for editing? A network engineer needs to reconfigure the WLAN settings on a 7925G phone, but the settings menu is locked. What key combo will unlock the menu? A network engineer is troubleshooting a VoWLAN deployment with VoFi Analyzer and sees a WiMOS score of 2.9. How would the tool describe this value? An engineer is studying the TSM for a VoWLAN user experiencing issues using a CCXv3 device.